Heading east on NY route 7, towards the Vermont border, the sky had the appearance of an expressionist painting in shades of gray, with streaks moving in different directions, slightly distracting me from driving. The trip so far, up the New Jersey Turnpike, up the Garden State Parkway, then on to the New York State Thruway to Albany had been wet and dreary, but uneventful. I was heading up, for the second time in a month, to spend a few days with friends in the Green Mountains. Passing through Troy, I got a sense the weather might be changing. One day earlier I had a new set of tires put on my 2008 Saab. I only have 34,000 miles on it, but I had noticed lately my anti-lock brakes activating even on light rainy days. I’m a careful driver, so it concerned me that even though it appeared sufficient tread was still on the Pirellis which were original with the car, they seemed to have lost the ability to grip the road. Heading into the mountains and snow, I didn’t want to deal with unreliable tires. I chose Michelin MXV4’s, which my local Tires Plus had to order in for me. They are a four season touring tire, meant to handle well in rain and light snow. I considered real snow tires, but felt that I would need them for one trip, then not for another year, and I would still want to replace the ones I had. Crossing from New York 7 into Vermont, the route changes to Vermont 9. Having driven four hours, I needed to take a break, get a fill up, a snack, use the rest room, and stretch the legs. I usually stop at a Shell Station in Bennington, at the junction of Vermont 9 and 7. Yes, I would be heading up route 7. You would think Vermont and New York could work out these numbers so that 7 in NY was the same number in VT, but no, they are two recalcitrant states. I got out of my car, and started to pump the gas. In New Jersey, all the gas stations are full service. Only when I leave the state and need a fill up do I actually have to, or get to, pump my own gas. Who doesn’t love the smell of petrol on the hands? Stopping in at the convenience store attached, there was talk among the locals of how bad the driving conditions were in the mountains, the very area I was heading. In Bennington, the streets were dry and it was around thirty eight degrees. When Vermonters mention how bad the roads are, though, one ought to listen. Full of confidence, and desperately wanting to get to see my friends this night, I headed back onto the road and up Vermont 7. I popped open a short can of Pringles to keep me entertained as I headed north. Driving up to Manchester, I finally started to see some snow on the side of the road. It had been pretty much absent up to that point. But still, the road was clear. The real test would come when I reached the turnoff at Manchester, where, instead of heading into town to wisely wait until morning, I bravely ventured east into the Green Mountains. The guy at the gas station in Bennington got it right. Very quickly, as I headed up the mountain road, ascending as I went, the snow was already coming down. It gets tricky driving in these conditions. 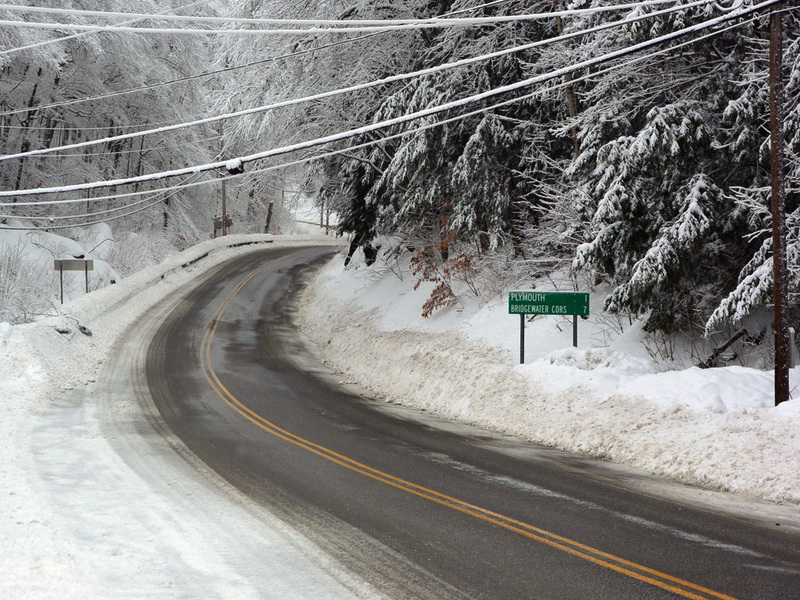 There is a long climb out of the Manchester region as the road heads east, and several large trucks were pulled to the side, their drivers putting chains on the tires. The road had not been plowed, and snow was accumulating at a rapid rate. My jaw muscles were tightening as I continued to climb, staying within the car tracks of whomever had passed before me, my wipers trying to keep up with the accumulation of snow on the windshield. I had the defroster blowing to keep the windshield warm so that the wiper blades could still work. Up to this point, I had made very good time, staying ahead of the speed limit and avoiding the speed traps. But now, I was slowing way down, and the last forty three miles of the trip were going to take considerably longer than an hour, judging by my current speed of around twenty miles per hour. While the road mostly went up, there were the occasional downhill segments as well, which felt very treacherous, especially if they rounded a curve. I tried to keep myself focused, and avoid imagining the car sliding off the road. I thought, at least there were snow banks on both sides of the road which could keep me from winding up plummeting down an embankment into a freezing stream. I did manage to stay on the road, past the entrance to the Bromley Ski Resort, up and down a few more hills to Londonderry. Here, the relative ease of traveling Route 11 was left behind, and I needed to turn north up Route 100. The first challenge is in the first quarter mile, as the road twists its way up a short but steep hill. With the Saab still staying on track, I continued this adventure at a very modest pace, still needing to drive in the tracks in the road which were now filling with new snow. Before, on Route 11, while I shuddered as each logging truck and four wheel drive SUV passed in the opposite direction, at least someone would have noticed me go off the road. Here, on Route 100, I seemed to be alone. This was more frightening, not having any witness available should I slide. In the dark, snow coming down, I managed to continue on the windy course of Route 100, holding a steady 15-20 miles per hour. I knew that up ahead, there was a sharp right turn to stay on 100 north. I’ve driven this route many times before, but I didn’t remember exactly where this turn comes. One thing about snow, though, it does reflect light, and make even a dark night seem a little brighter. I passed through the little village of Westin, with its classic New England B&B, the Westin Inn. It beckoned me to just pull in and take a room for the night. Yet, I continued driving, knowing there would be good food and beer and good friends when I reached my destination. Driving on, I noticed some familiar landmarks, a barn, a curve in the road, and noticed a signpost up ahead. The signs were completely caked with snow so that they were unreadable, but I recognized the turn to stay on 100. I slowed to quite a crawl to negotiate the turn, and kept on. This, I knew, was the most challenging part of the route. The road climbs and descends at pitches up to 19% grade, and I knew my front wheel drive sedan was not designed for this. If I did slide into a ditch, I knew the response from whomever would rescue me would be one of derision, that I was foolhardy to think I could handle this road in these conditions without a serious four wheel drive ve-hic-le. I finally crested the last hill leading down to the town of Ludlow. As I again slowed so not to skid off the road during my descent, for the first time in many miles I started to get a cue of drivers behind me. I hoped they wouldn’t drive too close, since I knew I would be going very slowly on these last few miles into Ludlow. As I neared the town, the road showed signs of recent plowing. My jaw muscles, now tetanic from being contracted so long, were starting to relax. I made it onto the main street in Ludlow intact, thankful I had not lost control on that snowy ride through the mountains. In Ludlow, I had a few items to pick up. First and most important was a stop at the Brewfest Beverage Company, conveniently located at the junction of Routes 100 and 103 in Ludlow. The parking area was thick with snow, but I didn’t care. I pulled in and walked in. It felt very good to stretch my legs after the drive. I picked up a sixpack of Long Trail Double IPA, a four of Long Trail Triple Bag Ale, a sixpack of The Shed Mountain Ale, and a Silverado Cabernet. Back in the car, I had a bit of trouble getting through the thick snow which had piled up in the parking lot, but managed to blast my way through and get back on the road. Another block and I stopped at Shaw’s market to pick up some food for my hotel room. There was a fair amount of traffic along this road, and the plows had come through, making it easily passable. 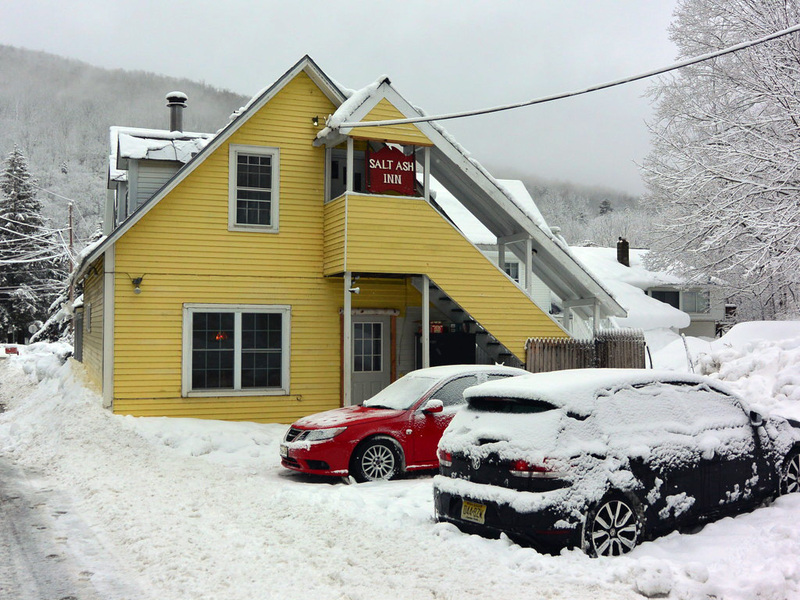 A couple of miles down the road and I again headed north on Route 100, for the last few miles to my destination, the Salt Ash Inn in Plymouth Notch, at the junction of 100 and 100a. As I pulled up to the inn, I realized I had made it intact, and was thankful I had made the decision to get the new tires. I don’t think the old tires were up to the task, and there were definitely points along the way I would have lost control had the old tires still been on the car. I stepped out of my car, and went in. This inn, the Salt Ash, is unlike any other I’ve stayed in before. While it has a very nice Vermont country feel to it, and it is certainly charming visually, it is very rustic in that one is mostly on one’s own in this place. There’s a sign in the hall to ring the innkeeper on an old fashioned handset phone, all in black. Al, the innkeeper, showed up a few minutes later to give me my key, a regular dead-bolt key on a key ring, and clue me in on my room’s features. It was the Union room, a small, one-bedroom room with a bit of a slant to the wood floor. The bed was very comfortable, but it was squeezed into the small end of the trapezoid shape of the room. It had a thermostat to control the radiator, a sink which had very slow flow, and a toilet and small shower. Perfect for me, traveling on my own. It would work for a couple, too, but no room for an extra bed. The one homage to modernity in the inn was free WiFi, which was quite welcome. 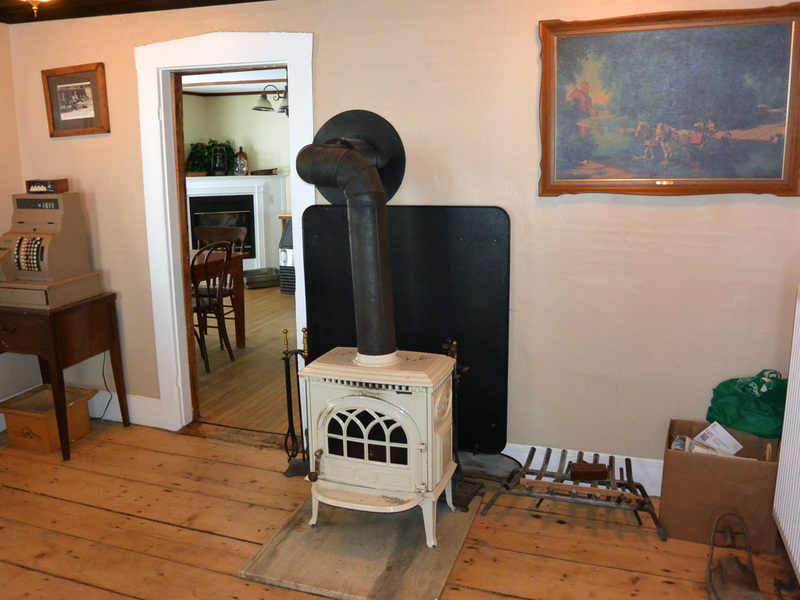 Unlit wood stove in the living room of the inn. After dumping my bags in the room and skis in the front room of the inn, I joined my friends who had been here for several days already. They were staying in the inn’s annex, which is a converted out building, with a large one bedroom apartment on the first floor, and two smaller rooms on the second. 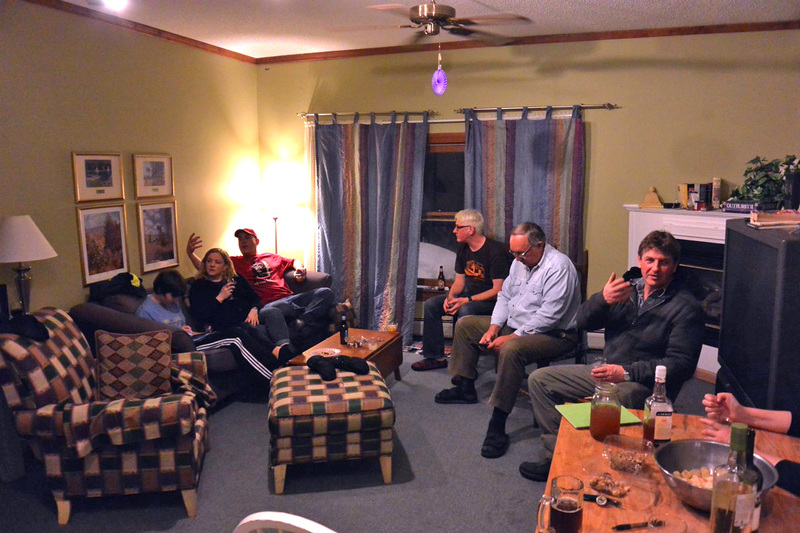 We used the kitchen and living area for meals and hanging out. The group consists of friends from both sides of the Atlantic, the U.S. East Coast contingent and the Londoners. We planned to ski at Pico the next day, which was a Thursday. That’s significant because Pico is closed Tuesday and Wednesday, and with the new snow that fell, we were looking forward to a day of fresh powder, or at least what passes for it in Vermont. The gang in the annex, planning our day at Pico. 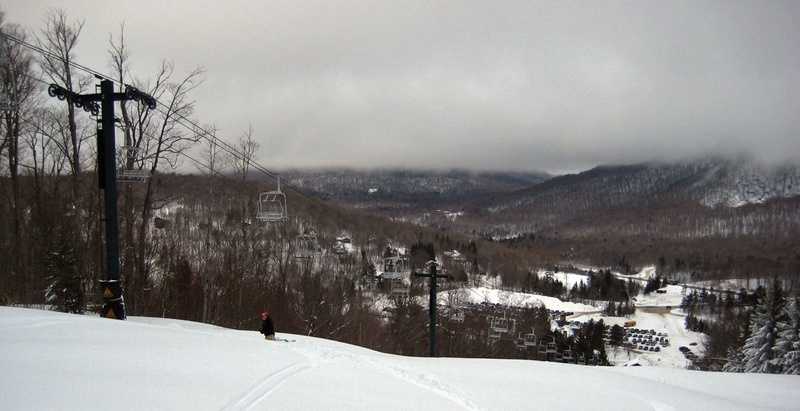 This was my first time at Pico, the smaller sibling of Killington. While smaller, it has some very nice runs, and, as we would find out, there is the possibility of finding some unskied areas to make fresh tracks. We happened to meet up with a local skier, a friend of one in our group, who took us on a tour of the ski area we would never have known about if not for him. We traversed through the trees several runs over, making our own trail, until we came to an unused run served by an ancient lift which was not in service. There we had the pleasure of an untouched slope all to ourselves, with about 12 inches of new snow on it. Skiing it wasn’t easy. It made me look pretty awkward, but the others in the group handled it very nicely. This tour of the mountain brought us to several more unused, or little used, slopes, so we had quite a good day of it. Fresh snow on a hidden run at Pico. That evening, one of the women in our group, Christine, made a concoction of eggplants, zucchini, potatoes and onions to go with some spicy sausages we cooked in the oven. I found out that the English, ever teaching us the right way to speak, say aubergine and courgette respectively for eggplant and zucchini. Regardless, it was delicious and went well washed down with the local Vermont beers. We also had some blueberry pie and the famous Ben and Jerry’s Vanilla ice cream, without which a trip to Vermont would be incomplete. The following day we had plans to go cross country skiing. Being a runner, I was looking forward to this, as I had no hope of getting any running in, given the road conditions. In German, cross country skiing is Langlaufen, or “long running”. I’m sure there’s supposed to be a “ski” in there too, but it’s understood. We drove about 30 miles south to Grafton Village, home of the Grafton Ponds Outdoor Center. 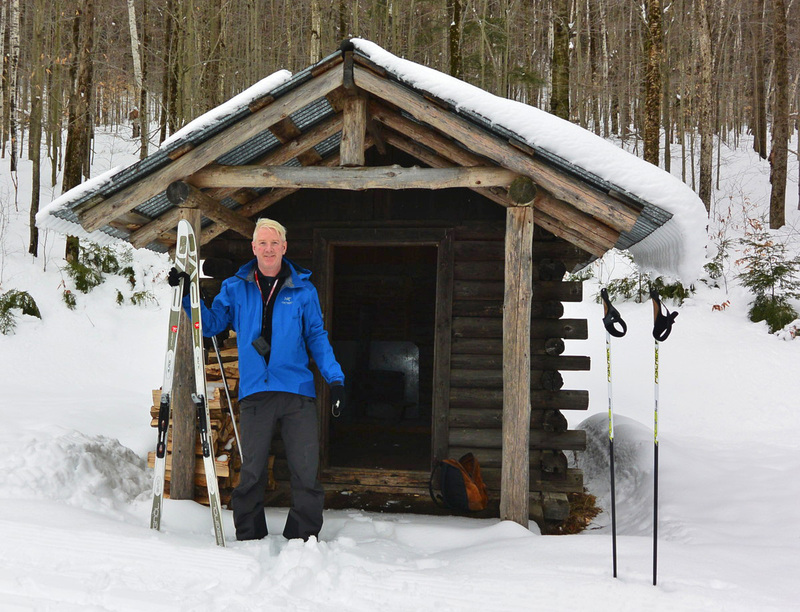 There they have cross country ski trails and ski rentals. Our group, being very much an alpine skiing group, was bold to try this form of the sport. I had done two days of cross country about three years ago, and that was the extent of my experience. Of the others in the group, one, Simon, had the most experience, having gone several times, up to a week at a time. The rest were all newbies. 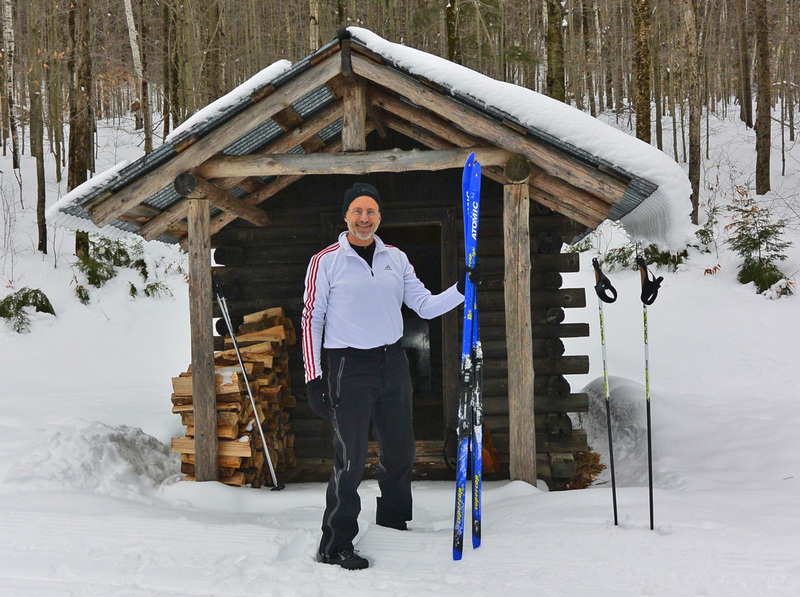 Since I brought my own skis with me, I didn’t have to rent equipment, but the others did. The rentals are much cheaper than downhill equipment, and the pass for the trails is likewise a lot more reasonable, about $14 for a half day. My practically unused cross country skis. The area has a flat trail which runs around a large pond, and trails leading uphill into the woods. At the top-most trail there is a cabin. Reaching it is proof you were able to make it up the most difficult climbs. What I discovered, but actually already knew, is that descending is a lot more difficult than climbing. Climbing takes some strength and conditioning. Descending takes knowing how to slow your descent using ridiculously skinny, edgeless skis on a narrow trail which has hair-pin turns. After a run around the pond to get used to the skis, the intrepid Simon and I headed up the trail in the woods to the cabin, naturally. Getting there was addictive. As we went along the trails, one got the wonder of cross country skiing, shushing along the quiet flat parts, enjoying the solitude in the woods, and using the herringbone technique to climb to the next level. 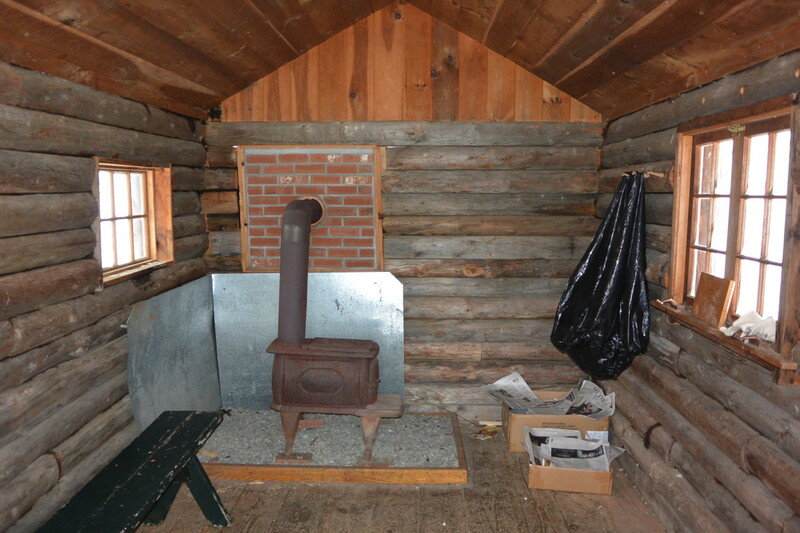 We ultimately reached our goal, the cabin. It was small and unassuming, but probably welcome under colder conditions. As it was when we were there, the temperature was close to 40 degrees, so we hardly needed warming. As predicted, the descent back to the center was treacherous, mainly for me. Simon, with his advanced cross country skills had no trouble negotiating the tricky downhill segments. I, on the other hand, had all sorts of trouble, basically controlling the descent about three quarters of the way down each switch back turn, then wiping out. The conditions were not ideal for a newcomer to the sport. The warm day left the snow soft and wet, not dry and crisp which would have been manageable. At one point I had to take off a ski to get back up, and quickly discovered the idiocy of that move. The ski slipped out of my hand, and with no ski brake as on an alpine ski, it easily skittered off into the woods. Fortunately, it hit a tree and stopped. I went tromping after it in deep snow, almost up to my hip, but managed to get the ski back and crawl back up onto the trail. 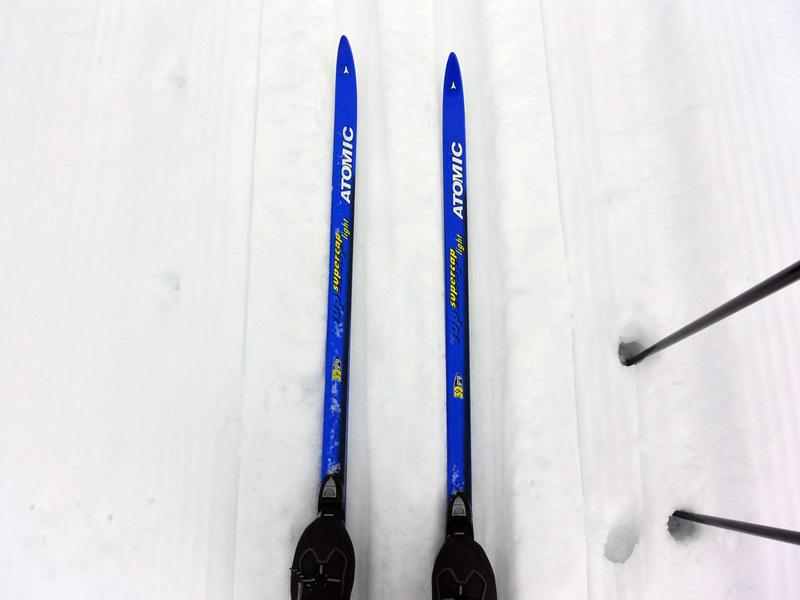 I walked about fifty feet downhill, to a flatter segment, and put the skis back on. Amazingly, Simon had patiently waited for me, and we went together the last kilometer or so down to the ski center. As we descended further, a tall, somewhat natural looking woman, dressed in sweat pants and a long sleeve cotton T-shirt, who had been skiing circles around us, passed in the opposite direction and said, “congratulations, you conquered Bear Hill,” and flew by for another loop. The others in our group had long since finished their experiment with cross country, and were ready to depart. 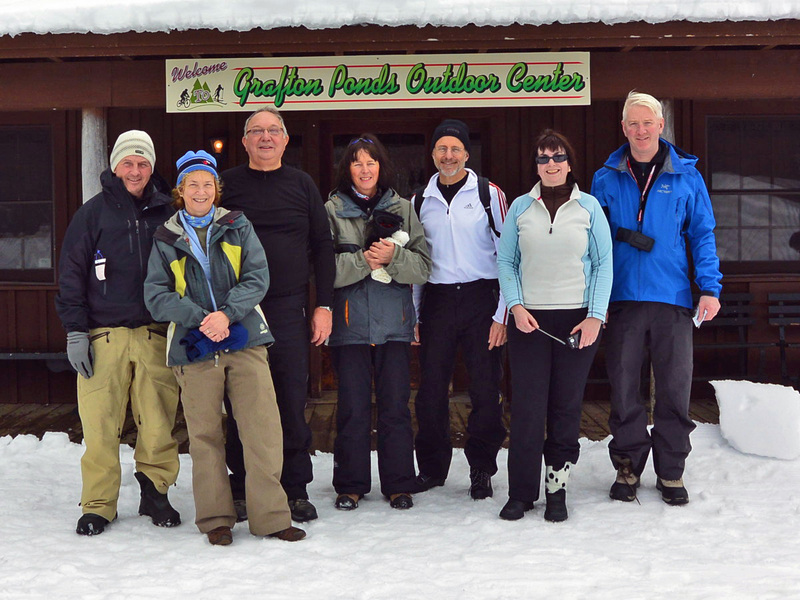 The gang at the Grafton Ponds Outdoor Center. We were eager to try some of the famous Grafton Village cheese, made locally. We stopped in at the cheese shop, sampled about everything we could sample, and contributed a bit to the local economy. We then headed off to Manchester Center, to allow for a little shopping at the outlet stores. I went to my favorite bookstore in the world, Northshire Bookstore, an independent and thriving bookstore which is a treat to visit. I bought Paleofantasy, by Marlene Zuk, a detailed and well researched work debunking the myths around the new fads of “paleo” living. I also picked up an Alan Furst novel about spies in the pre-world war two era, Spies of the Balkans. It promises to be an exciting read. That evening, we had dinner in the Echo Lake Inn, for their Friday night, three course, $23 special. We had a wonderful dinner, a great value for the price, since the quality was very good, along with some very nice wines from California. The next morning, we had breakfast together, and then I took off. I left the key of my room on the table with the phone, figuring Al would find it. The ride home would be a lot less dramatic than the ride up. The sun was out, the road was clear, and the traffic, light. I always enjoy my time up here in Vermont. Vermonters are a tough lot. They survive severe weather, and in the case of the recent hurricane, Irene, some pretty damaging flooding from which they are still recovering two years later. Most of the local people we spoke with here had stories to tell of homes and business flooded, or even completely washed away, along with roads and bridges. But, they have managed to rebuild and enjoy their mountain home, clearly very dear to the people of this state. Next up, back to real running, with the Caesar Rodney half marathon.